The TL7759 is a supply-voltage supervisor designed for use as a reset controller in microcomputer and Microprocessor systems. The supervisor monitors the supply voltage for undervoltage conditions. During power up, when the supply voltage, VCC, attains a value approaching 1 V, the RESET and RESET outputs become active (high and low, respectively) to prevent undefined operation. If the supply voltage drops below the input threshold voltage level (VIT-), the reset outputs go to the reset active state until the supply voltage has returned to its nominal value (see Timing diagram). The TL7759C is characterized for operation from 0C to 70C. This is one package pinout of TL7759,If you need more pinouts please download TL7759's pdf datasheet. 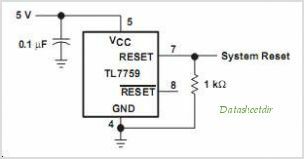 This is one application circuit of TL7759,If you need more circuits,please download TL7759's pdf datasheet.